A couple of days into a weeklong service mission in Haiti, Mikado Hinson, the Texas A&M University football director of player development, was clearly excited to be in the company of his student-athletes and the people of Haiti. “It has exceeded my expectations,” Hinson said of the College Station, Texas, school’s second trip to the poorest country in the Western Hemisphere. “It’s been great to see our student-athletes have life-transforming experiences. I have not been disappointed in anyone in our group,” said the licensed and ordained minister. On this day, 67 Aggies, representing 10 percent of the university’s student-athlete population and nine sports, planted trees, painted multiple houses and engaged locals during open discussion forums in challenging weather conditions. Hinson passionately expressed his optimism for Haitian people and his belief in the alternative learning experience. It’s no coincidence that the athletes are in Haiti during Haitian Heritage Month in the U.S.
After working with coach Kevin Sumlin at the University of Houston, Hinson joined one of the nation’s and Southeastern Conference’s top football programs in 2014. A year later, Hinson was contacted by Jay Richardson, an Aggie and Mission of Hope Haiti staffer. “I was interested when Jay approached us, but we were busy with the season and I asked him if we could connect when things slowed up,” said Hinson, a Kansas native, husband and father of three. Among last year’s delegation who were ambassadors of the trip were NFL draft picks Daeshon Hall (defensive end, drafted by Carolina) and Jermaine Eluemunor (offensive guard, drafted by Baltimore), offensive lineman Koda Martin, women’s volleyball player Ashlie Reasor and this year’s No. 1 NFL draft pick, Myles Garrett. Former Aggie quarterback Trevor Knight, who recently signed as an undrafted rookie free agent with the Arizona Cardinals, completed his fourth mission to Haiti last year. Knight, who began his career at the University of Oklahoma and transferred to Texas A&M as a graduate student, took his first mission trip as a freshman with the Sooners. For close to 16 years, Hinson served as chaplain and campus director for Fellowship of Christian Athletes (FCA) while acting as team chaplain and character development coach for the University of Houston’s football program. The spiritually charismatic leader and educator also served as the Houston Rockets’ team chaplain from 2000 to 2008 and on the FCA National Chaplain’s Task Force from 2010 to 2013. Officially founded in 1998, Mission of Hope Haiti (MOH Haiti) has since grown from a small mission into a fruitful organization that now runs an orphanage, medical facility, school and church. Through partnerships with higher education institutions such as Texas A&M, University of Oklahoma, University of Texas and Texas Tech, MOH Haiti also serves outside of its property on the island by helping other orphanages, churches and schools throughout the country. Existing to bring life transformation to every man, woman and child in Haiti, MOH Haiti currently feeds more than 91,000 children daily, affects more than 9,000 students through education, trains more than 1,700 farmers and provides medical care to more than 30,000 patients. 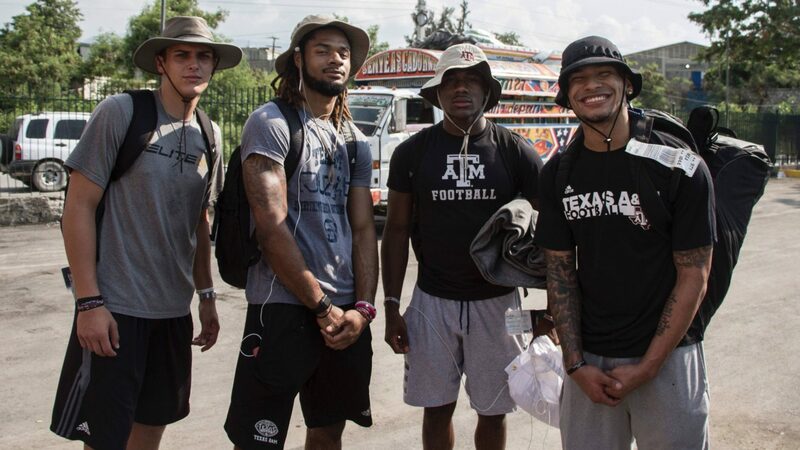 Texas A&M University student-athletes pose for a picture during their service mission in Haiti with Mission of Hope Haiti. Last week, the University of Oklahoma completed its eighth annual service learning initiative, Sooners 4 Haiti, with football players Ogbonnia Okoronkwo and Caleb Kelly serving alongside several women’s basketball players and head coach Sherri Coale. Texas Tech student-athletes returned from their first mission Wednesday after uniting with OU and A&M student-athletes last week, the same day University of Texas student-athletes began their first mission to the island nation. 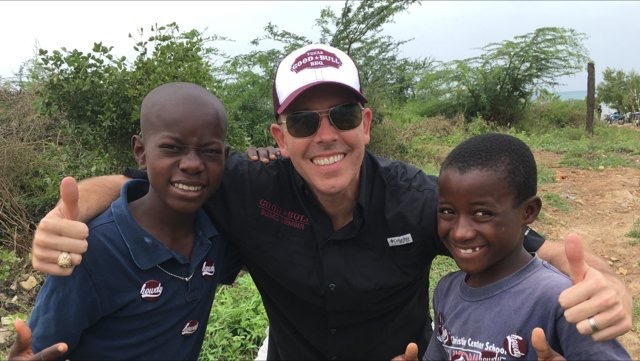 Good Bull BBQ owner and passionate Texas A&M alum Thomas Sitton with two Haitian students during last week’s mission to Haiti.